Fall is a time for things like changing leaves, apple picking, corn mazes and pumpkins. As the seasons change it is so much fun to see the clothes in the department stores change, the holiday section at Wal-Mart transformed and the featured books at the library change. While not everyone celebrates Halloween, most people can appreciate an over-sized pumpkin as a harvest decoration, and kids are fascinated with pumpkin patches and seeds. 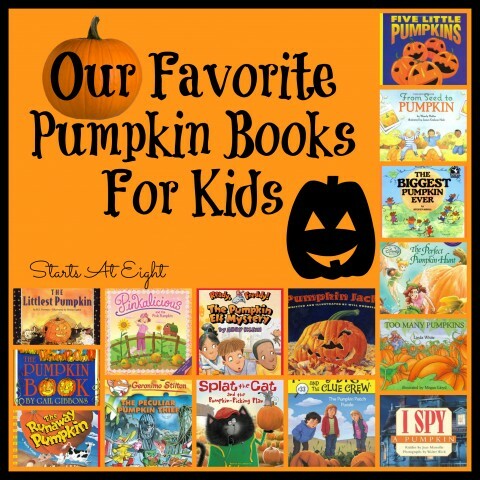 This is a collection of some of our favorite pumpkin books for kids (in no particular order); from picture books, to character books, and chapter books too! Splat the Cat and the Pumpkin-Picking Plan – Splat goes to a pumpkin patch with Seymour, and he is determined to find the biggest pumpkin ever. But when he finally does, Splat finds out the real challenge isn’t the pumpkin picking—it’s how to get the pumpkin home! The Pumpkin Book – Explains the complicated process of growing a pumpkin from planting, to cultivating, and the harvesting of pumpkins using bold illustrations and simple text. The Runaway Pumpkin – A story about an enormous pumpkin that gets out of hand. The Baxter boys make the mistake of cutting it from the vine before they have worked out how to get it safely home. With a repeated rhythmic chorus that kids will love to chime in on, the pumpkin makes its way through the hillside farm, scattering animals and Baxters in its wake. Lewis’ words capture the rolling pumpkin’s “thumpin’ bumpin'” rhythm, and Schindler’s paintings extend the story’s tall-tale humor with detail and action that’s perfect for entertaining any child. Five Little Pumpkins – Five little pumpkins sitting on a gate.The first one said, “Oh my, it’s getting late.”Get ready for some wicked fun as these five pumpkins run and roll! Toddlers will want to chant along with this popular rhyme again and again. Pumpkin Jack – When Tim carves his first pumpkin, he names it Jack. When it finally begins to decay, he puts it in the garden rather than in the trash bin. As the months go by, Jack grows moldy, sinks into the leaves, hides in the snow, and finally sprouts a new plant. By the next fall, there are plenty of pumpkins for Tim to share at school. He keeps just one for himself and when he finishes carving it, he says “Welcome back, Jack!” The plant’s cycle throughout the seasons is told in an easy, straightforward fashion. Readers can hear the crinkle of old leaves, smell the earthy odors of the garden, and breathe in the crisp air of the first frosty day of autumn. Too Many Pumpkins – With countless unwelcome pumpkins to deal with, Rebecca Estelle turns disaster into a celebration. One day, years and years later, white-haired Rebecca was busy not eating pumpkins when–SPLAT–a giant pumpkin fell off an overloaded truck and smashed into her yard. She buried the mess so she wouldn’t have to look at it, and, as you might imagine, she witnessed a bumper crop the following fall, “Too Many Pumpkins”. The Biggest Pumpkin Ever – Traces the growing of one special pumpkin from its start as a tiny green bump on a vine to a huge carved jack-o-lantern that wins the town pumpkin contest. The pumpkin becomes the biggest and best pumpkin in the whole town and wins the contest because two mouse friends, Clayton and Desmond, without realizing it, are both taking care of it. They both fertilize it and water it throughout the summer. They both protect it from frost in the autumn. The pumpkin gets a double helping of TLC. When the huge pumpkin is finally ready it is too big for one mouse to haul it the contest so the two mice (who have finally discovered each other) work together and share the prize and the fun. The Littlest Pumpkin – It’s Halloween, and the Littlest Pumpkin has big dreams: she wants to be taken home by a child and made into a jack-o’-lantern. But the day goes by, and the Littlest Pumpkin is left alone at the farm stand. It looks as if her dreams won’t come true, until something unexpected happens…. The Pumpkin Patch Puzzle – It’s autumn in River Heights, and that means it’s time for the annual Fall Festival! Nancy, Bess, and George are excited for a whole week of games, rides, delicious treats, and the famous pumpkin-decorating contest. They are all participating for the first time this year! But the day the girls are set to compete, all the designs for the contest are stolen and the decorating supplies are destroyed. If the culprit doesn’t come forward, the contest will be canceled—and a River Heights tradition will be ruined. It’s up to Nancy and the Clue Crew to solve this pumpkin patch mystery! Pinkalicious and the Pink Pumpkin – Pinkalicious is on a search to find a pink pumpkin in this pinkerrific new lift-the-flap book! With thirteen flaps that open to reveal hidden surprises on every page, Pinkalicious fans will be perfectly pleased! The Peculiar Pumpkin Thief – Halloween is a few days away when all of the pumpkins in New Mouse City disappear! There’s a thief on the loose, and the thief wants to stop Halloween. At the same time, all of the mice in New Mouse City receive an invitation for a free trip to the brand new Mystery Mouse Theme Park. Geronimo knows something strange is going on, but will he and his detective friend Hercule Poirat be able to solve the mystery in time to save Halloween? The Perfect Pumpkin Hunt – It’s autumn in Pixie Hollow, and that means it’s time for the Fall Ball! Prilla is thrilled when she’s asked to find the perfect pumpkin for the ball, but she soon realizes that her job is not as easy as it seems. I Spy A Pumpkin – The perfect Halloween treat–the ninth book in the bestselling I Spy Scholastic Reader series has easy words, rebus clues, and fun search-and-find photos! Pumpkin Elf Mystery – Who is the Pumpkin Elf, and where is he? Freddy Thresher and the rest of his first-grade class follow clues to find a mysterious Halloween elf who comes to their classroom at night and plays tricks on everyone. The teacher says that the Pumpkin Elf will only leave treats if the class behaves. Can Freddy and his friends find the elf, mind their manners, and collect their pumpkin surprises? I haven’t seen several of these, but we need to check out the Ready, Freddy! books for sure since my little guy is a Freddy 🙂 Thanks for sharing at #laughlearnlinkup! Lara, my son loved the Ready, Freddy! books. I liked them way better than the Junie B Jones books because I had a hard time getting past Junie B’s horrific grammar! What a great collection! Thanks for sharing this at the Homeshool Showcase and the #laughlearnlinkup! Haha Kim! Luckily I still have an 8 year old so I can get away with some of these favorites still! Such a fun list. We love Five Little Pumpkins. 4mulaFun.com | 15 Spook-tastic Halloween Activities!